Here’s a good rule of thumb: if a window pops up on your computer alerting you that your device has been compromised by a malware attack and offers to fix the problem by calling a toll-free number, there’s a good chance it’s a scam. To that end: federal regulators and the state of Florida have accused an international tech support operation of bilking millions of dollars from American consumers. The Federal Trade Commission and the Florida Attorney General’s Office announced Friday that they have filed a complaint against several tech support operations in Florida, Iowa, Nevada, and Canada, accusing the companies of deceiving consumers on the security of their computers. According to the complaint [PDF], since January 2015 BigDog Solutions LLC, PC Help Desk US LLC, Inbound Call Specialist LLC, BlackOpteck CE Inc., 9138242 Canada Corporation, and Digital Growth Properties, LLC allegedly relied on a combination of deceptive online ads and misleading, high-pressure sales tactics to frighten consumers into spending hundreds of dollars for dubious computer “repairs” and antivirus software. In some cases, the companies misrepresented to consumers that malware or hackers had compromised their computers and that the operation was associated with or certified by Microsoft and Apple to fix their computers. The operation often pushed advertisements onto consumers’ computers designed to resemble alerts from Microsoft or Apple. These alerts often render consumers’ web browser unstable; meaning that when one pop-up is closed another pop-up immediately appears. 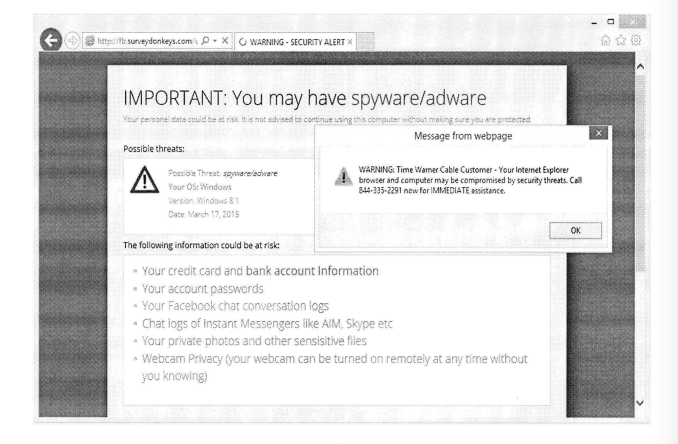 The ads warned consumers that their computers could be infected with malware and urged them to call a toll-free number in the ad to safeguard both their computer and sensitive personal information stored on it. Your personal data could be at risk. It is not advised to continue using this computer without making sure you are protected. • Chat logs of Instant Messengers like AIM, Skype, etc. The operators also drove traffic to their websites through paid internet ads that appear in search results on sites like Google. Once computer owners called the number in the ad they were routed to a call center in Boynton, FL, where telemarketers claimed they were certified or authorized by Microsoft and Apple to service products manufactured by those companies. The telemarketer would transfer the caller to a technician who would run a series of “diagnostics” by gaining remote access to the device. These tests would almost always find the existence of grave problems on the computer. The techs would then claim they could fix the problems immediately for $200 to $300. In some instances, the telemarketers would tell customers that they needed to spend an additional $200 to $500 to replace their existing antivirus software, which the defendants always claimed was outdated and ineffective. The complaint alleges that techs would then push the device owner into purchasing an ongoing technical support plan raining in price from $9.99 to $19.99 per month. The FTC and Florida AG’s office, however, allege that these software applications could be acquired for a fraction of that cost elsewhere. On Friday, the FTC announced that a federal court temporarily shut down the operation, froze its assets, and placed control of the business with a court-appointed receiver.